If I go missing. This is one of Basket Kase's designs. I love it! 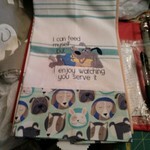 Chai It Kitchen Towel I had this design for a while and finally got around to stitching. Oh, my ! My usb stick with my designs ready to the machine is missing. My cat has a smile on her face. The older she get the more demanding she is for attention. She knocks things off and where am I to look? Ain't no Mama like the one I got. I saw this and had to stitch it. Happy Easter. I was a bit disappointed that the stitches sunk in to these terry towels. Yes , I did use solvy on top and decided to wash them to get the remainder of the solvy out. 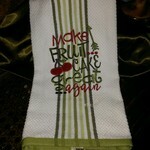 Golf towel. This is a gift for my hair dresser. She also is a golfer. Make Fruit Cake Great Again. All I want for Christmas apron.